I arrived in Livingstone, Zambia at 1 in the afternoon on a beautiful day. The first thing I noticed about Zambia is that the people are very relaxed (chill). Unlike many of the countries I have been where I was constantly being watched and searched by armed military guards, the immigration process in Zambia was anything but. Nobody watched us as we walked from the airplane into the terminal building. While I had to pay a steep $80 for a multiple entry visa, the South Africans simply walked right through the makeshift line and flashed the outside of the passport to the immigration officer. They didn’t even check the picture pages. Zambia is officially the world’s easiest country to sneak into. I was picked up from the airport and was transported to my hostel, Jollyboys. Jollyboys was considered to be the best hostel in Zambia, but let’s be real, how many hostels are there in Zambia? Anyways it was a nice place with a pool, bar and nice dorms. The internet was slow and you had to ask for blankets but that was okay. The best part of the hostel was the people. Most of the people here were either volunteering in Malawi/other places in Zambia or taking a solo crazy overland trip through Africa. Not much in between. My bunkmate had been volunteering in South Sudan for the past 6 years. Since I was tired from the 20 hour journey to Zambia, I decided to celebrate by going on a sunset booze cruise on the mighty Zambezi River. Everything in Livingstone was amazing but the prices matched the fun. While the 2 hour cruise was stunningly beautiful, it cost $65 (well worth it). 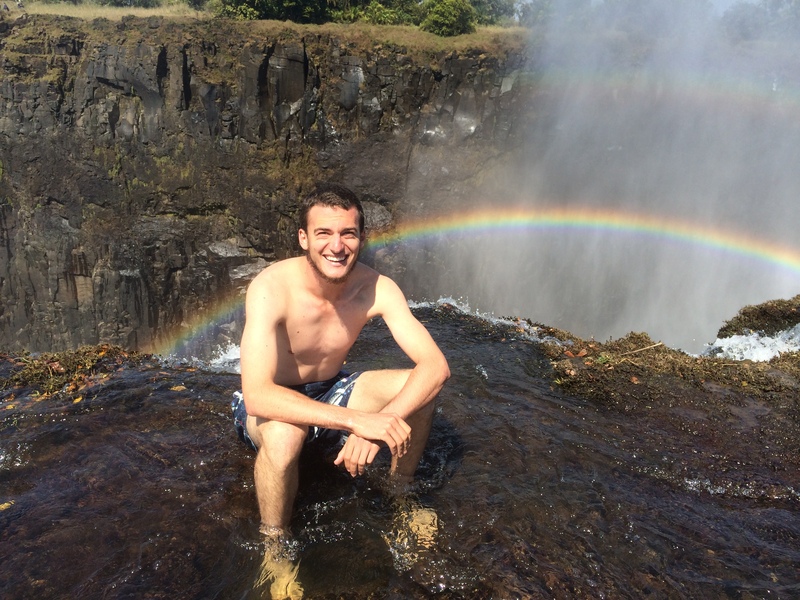 On the boat, I met some really funny Kiwis who gave me some great advice about what to do around Victoria Falls. That night, my bunkmate (from South Sudan) got malaria and was shaking violently with the chills. He did not look like he was having a fun time. I haven’t been taking my malaria pills so I immediately popped 2 pills. 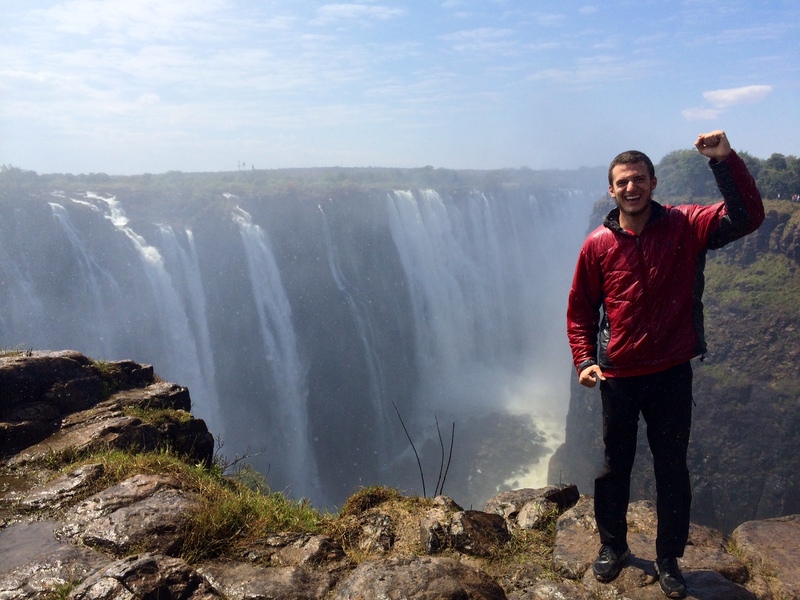 The next day, I took the free hostel shuttle to the Zambian side of the falls at 10am and walked around the park. The falls were over a mile long and 360 ft tall. I was able to walk on the gorge directly across from the falls all the way up to the center of what is called Danger Point. Victoria Falls had a number of strange weather phenomena. The first phenomenon was the constant mist that comes in the form of rain falling up due to the power of the falls. There was also a permanent rainbow in the falls. In the early and late light, this rainbow expands along the entire bottom of the falls. During midday, the rainbow became a double rainbow and sank to the bottom of the gorge. During the full moon, was apparently possible to see a moon-bow, a rainbow visible at night. I truly could not imagine a more beautiful place than Victoria Falls. In addition to the knife’s edge, I also was able to walk on the top of the falls and to a place called the Boiling Pot at the bottom of the falls. I spent 3 hours at the park but could have easily spent the entire day there. 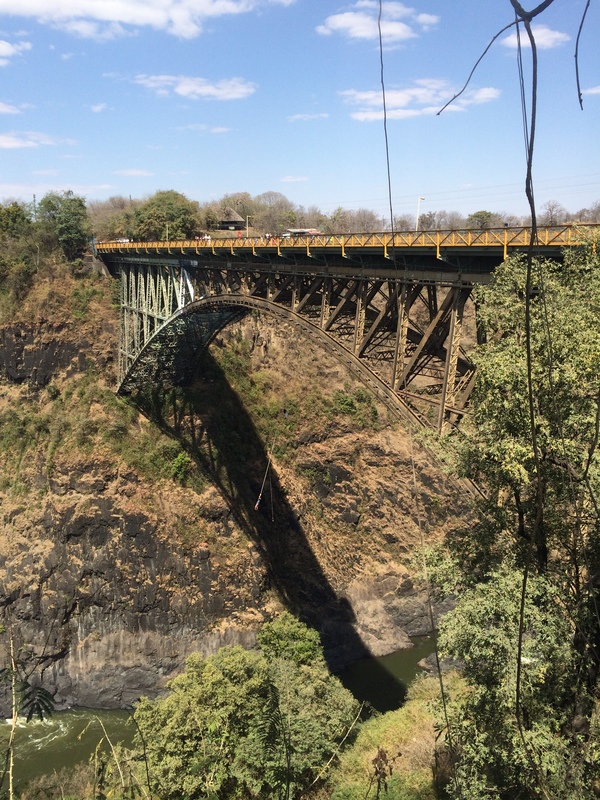 That afternoon, I went with my hostel-mates Ollie and Kate, my Wisconsin friend Becca and her two friends to the Victoria Falls Bridge to go bungee jumping. Because the bridge was located in the no-mans land between Zambia and Zimbabwe, we had to go through immigration. This time, we said we were going bungee jumping and they said okay and gave us a small white sheet of paper with the number 6 written on it (for the six of us going- no ID check no nothing). We handed it to the border guard and he let us all through. I decided to do a “big air combo” that included 3 activities for a whopping $200 (the bungee alone would have been $160 so this is a better “value”). We started out with a zipline where we soared across the gorge from Zambia into Zimbabwe. This is without a doubt the coolest method anybody could possibly cross an international border. We then did a gorge swing which was essentially a tandem bungee but right side up. Finally, we did the bungee. While I have bungee jumped before, the scenery of the 400 ft gorge and the view of the world’s largest waterfall is unbeatable. When we walked back through the Zambian immigration, we showed them the bungee certificate and they let us right through. After returning, the whole crew and some other people from the hostel all got dinner at Olga’s an Italian restaurant in Zambia… I got crocodile pizza- it was great. The next day I decided to go to the Zimbabwe side of the falls. I wanted to go for 2 reasons. 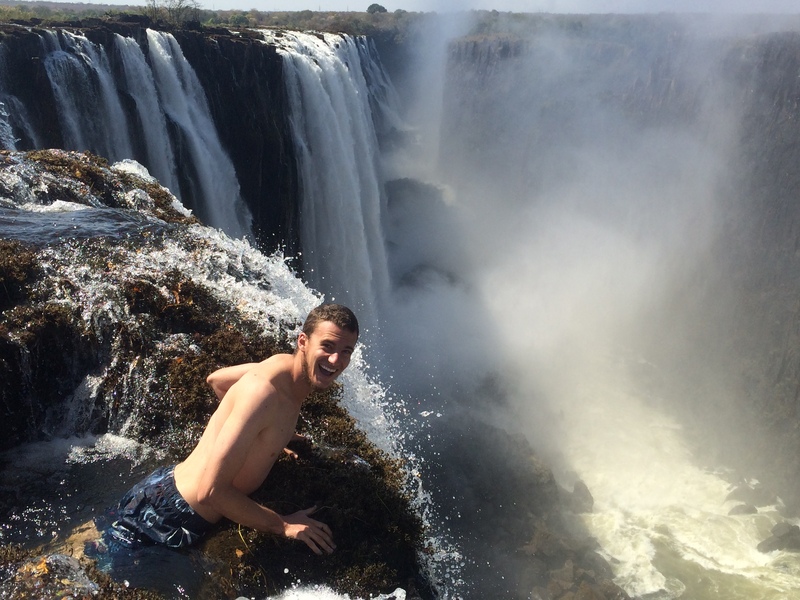 I wanted to see the other side of the falls and I wanted a reason to go to Zimbabwe. Once again, I walked across the bridge and through the no mans land on the Zimbabwe side which was full of baboons and warthogs. At the gate on the other side, I paid the $30 fee and got a really cool visa. The entrance to the falls was 50 meters past immigration. The Zimbabwe park was much nicer than the Zambian park- it had informational signs describing the history (both geologic and modern) and had much nicer walkways. 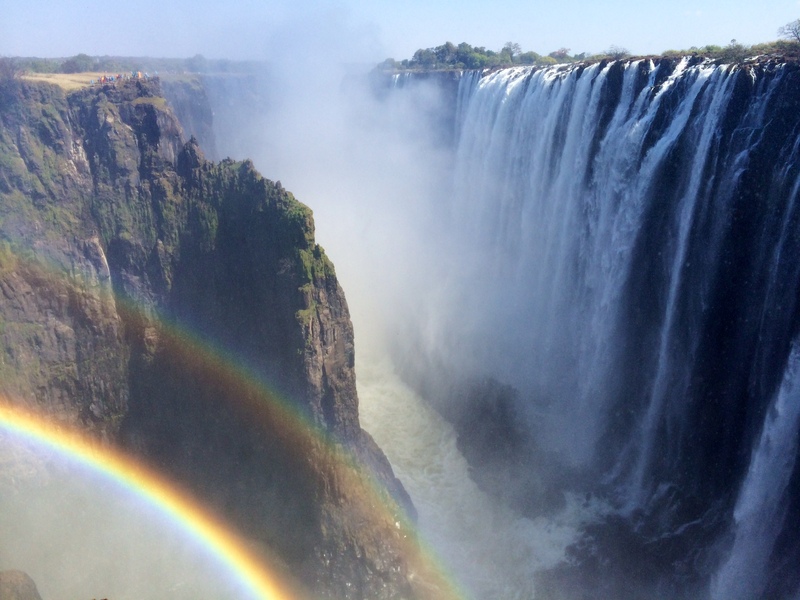 The Zimbabwe side is also directly across from the “main falls”, the world’s largest sheet of falling water. The mist/upward rain was quite strong there and it was difficult to see the falls. The final viewpoint was nicer than the Zambian side for photographs since there was no railing although it was more difficult to see the rainbows. After seeing the falls, I walked over to the town of Victoria Falls. Unfortunately there wasn’t much to do in the town center- it was only about 3 blocks long. I headed over to the Victoria Falls Hotel for lunch. The hotel was straight out of colonial Africa and I felt uneasy with the setup- an all black staff and all white customers (although that was the demographics of the local and tourist population here). There were also lots of old colonial posters. That said, the hotel, meal, drinks and views were spectacular. The lawn has a nice view of the bridge and the bungee jumpers. One of the coolest souvenirs from Zimbabwe was the currency. During the 2000’s Zimbabwe experiences massive inflation (10-30% a week!). It got so insane that they had a $100 Trillion bill. In 2008 they discontinued the currency so most places actually use US dollars. 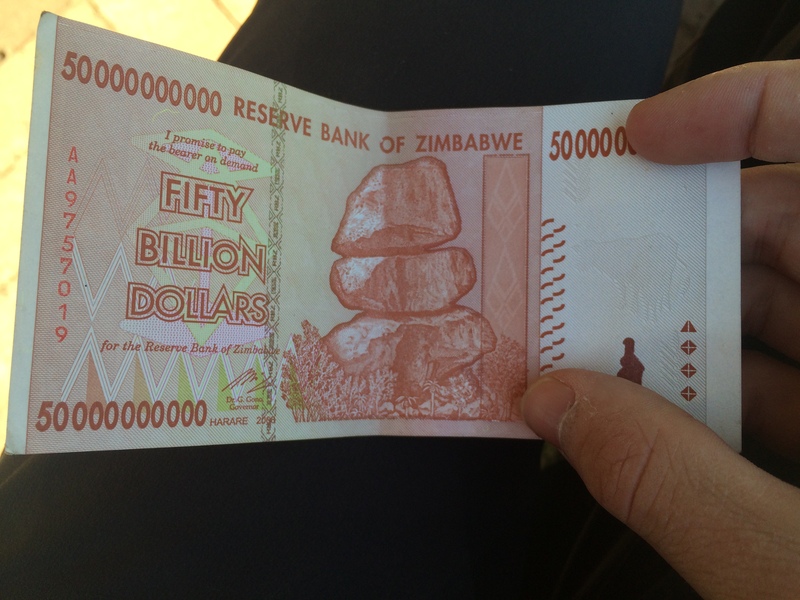 For $3, I bought 6 bills of which the largest was $50 billion. As I walked back into Zambia, I ran into some hostel friends who were about to bungee jump. So I watched them jump then went to the Royal Livingstone Hotel (the Zambian equivalent of the Victoria Falls Hotel) for high tea. The hotel was located about 500 feet upstream from the top of the falls and has zebras and giraffes wandering the grounds. We watched the sunset from the hotel’s deck overlooking the Zambezi River. Since most day trips started before the booking office opened at 7am, I needed to spend a day at the hostel to prep everything for the rest of my time in Zambia. At 8, I booked all my activities for the rest of the week which took 5 minutes. For the rest of the morning I worked on finalizing all the blog posts from Tanzania (I needed wifi, a real computer, and about 3 hours to complete a blog post). For lunch I went to a Zambian restaurant and are fried caterpillars in a chili sauce. They were surprisingly good. I then went to the local museum which talked about the history of Zambia. One of the most interesting sections talked about development. While most Westerners would agree that developing modern towns and infrastructure is good for a country, the museum claimed the opposite. Since development was mostly done in the Western framework (European style towns, more English spoken, international chains) the Zambian culture was being replaced by a Western culture which the museum calls “Their City” vs “Our Village”. While I heard this opinion in some of my anthropology classes in college, I have never seen it presented to the general public in such a rebuke of everything white. I agree with the museum since so much of the development only aids outsiders and never really helps the locals. Rather than be poor and living in their village, they are equally poor but now subservient to their new foreign masters. If the development was actually spurred by Zambians I would think differently but every business I have visited in Zambia (the hostel, the Italian restaurant, the bungee, the fancy hotels) were all owned by foreigners who took all the profits. That said, without these foreigners, there would be no tourist infrastructure so it was a difficult moral dilemma. That afternoon, A hostel-mate was going to go on a helicopter flight over the falls- it cost $300 for a 15 minute flight- out of my price range. I gave him my camera and I got the most amazing picture. We got dinner at a locally owned Zambian restaurant. While the food was fantastic, it took is 3 hours to get our food. There were definitely benefits to having foreign-owned restaurants. 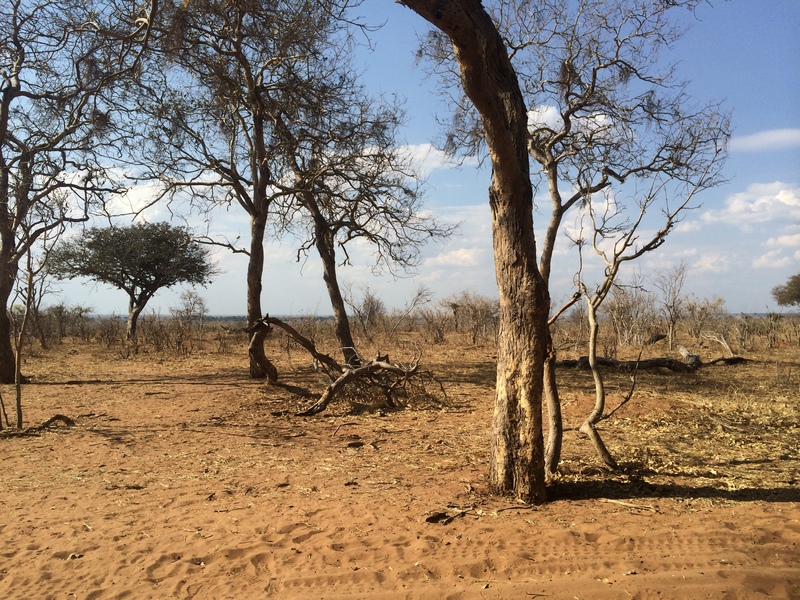 The next day, I went on a safari in Chobe National Park in Botswana (an hour away). 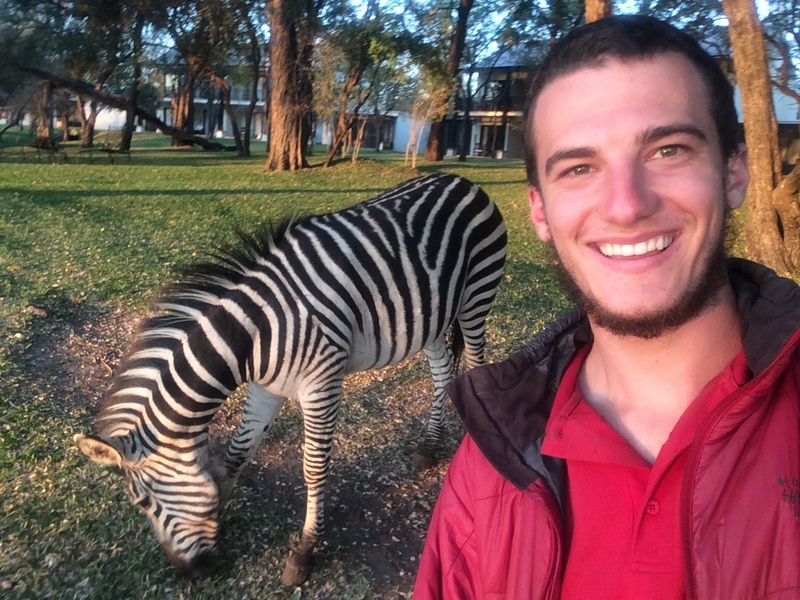 While I certainly felt safari-ed out, I really wanted to go to Botswana because I couldn’t think of another reason to go to Botswana and Chobe was the 2nd most popular attraction the country. The border between Zambia and Botswana was the world’s shortest international border- a single point in the Zambezi River where 4 countries come together (the other two were Zimbabwe and Namibia). Once again we ran into incredibly lax border security. This time my guide took my passport and walked into the building for me. I neither had to leave the car nor interact with any Zambian government official. They really just didn’t care. 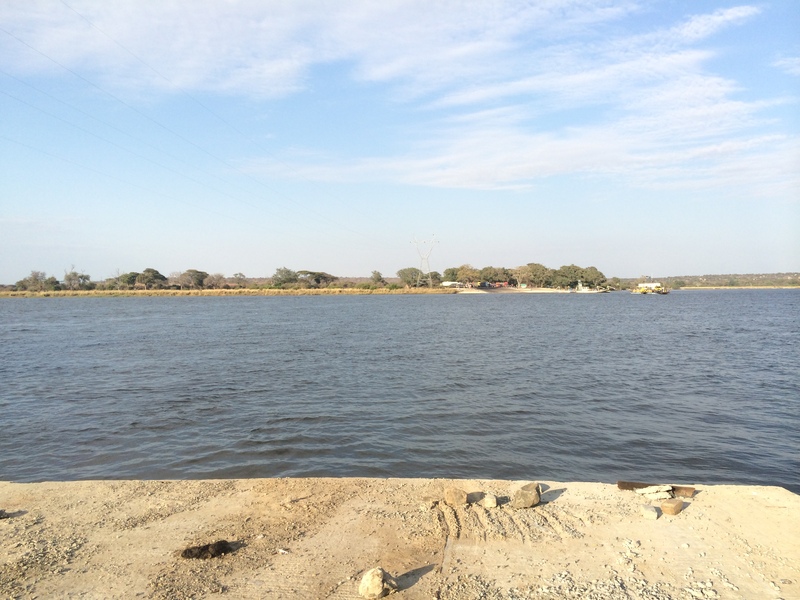 Since there was no bridge, we had to take a speedboat across the river to Botswana. 4 countries in 1 photo! Once in Botswana, I was taken to the Chobe River for a boat safari. The boat safari was very different from a land safari. I was able to see different animals and was able to see the larger animals in an aquatic setting. The undisputed highlight of the safari was watching a group of 6 elephants and one baby cross the river. At first the elephants were hesitant to enter the water but eventually formed a pack around the baby to protect it from hundreds of crocodiles and hippos in the river. After the boat safari, we went on a game drive where I saw the King of All The Elephants. It was at least 16 feet tall and had massive majestic tusks- a true spectacle of nature. While I certainly wouldn’t want to see any more animals, the boat safari provided a different experience that made the trip well worth it. I decided to save the best experience of the week (and the trip) for my final day. Livingstone Island was located directly at the top of the middle of falls. To get there I had to pay $90 for a boat from the Royal Livingstone Hotel. There, a guide took me to the very edge of the falls. The view was the single greatest thing I have ever seen: 500,000 gallons of water pouring over the cliff every second and a 400 ft tall circular double rainbow shining in the mist a mere 30 ft away. The view almost brought me to tears it was so beautiful. The guide then helped me swim across the river to the Devils Pool at the top of the falls. There, I was able to swim in an infinity pool at the top of the falls. I even could lean over the falls to see the mythical end of the rainbow. No experience that could possibly top this. I then headed back to town to check out the market. I did some amazing bargaining for wood carvings. I even convinced one merchant to accept my leftover Tanzanian money! While I did a great job there, most of the other tourists spent quite a bit of money. The salespeople here are truly the best in the world (with the exception of the rug salesman in Madurai). I really had the best time in Zambia and the Victoria Falls area. I would strongly urge any traveler to put it at the top of their bucket list.